On Saturday, Associated Press journalists Jason Dearen and Michael Biesecker reported at least five toxic, Houston-area Superfund sites in the path of Hurricane Harvey had been deluged with floodwater, potentially distributing the assorted nasty things contained within across a much larger geographical area. The AP report noted while its reporters were able to access the sites via boat, the Environmental Protection Agency was not on scene, and did not provide a timeline for when its staff would be able to visit them. 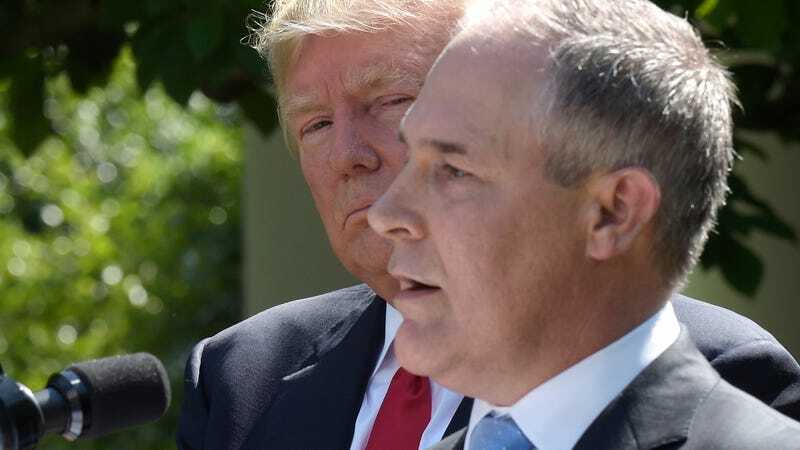 Now the EPA, which is under the control of Donald Trump appointee and longtime EPA hater Scott Pruitt, has fired back with one of the administration’s favorite tactics: smearing the messenger. In an extraordinary statement that appeared on the agency’s website on Sunday, the EPA called the AP report “misleading” and attacked Biesecker’s “audacity” and credibility. “Here’s the truth: through aerial imaging, EPA has already conducted initial assessments at 41 Superfund sites—28 of those sites show no damage, and 13 have experienced flooding,” the EPA wrote. Notably, the EPA tried to bury that its “initial assessment” was conducted with “aerial images,” not actual on-site assessments, and that the agency had failed to visit at least 11 possibly storm-damaged Superfund sites as of Saturday. That is completely in line with the original AP report. In a followup statement, EPA Associate Administrator Liz Bowman claimed the AP was “once again” attempting to “mislead Americans” by “cherry-picking facts,” and slammed the report as “yellow journalism.” The statement also links to far-right website Breitbart, one of the president’s favorite websites. Since the EPA did not actually contest any of the facts in the AP article, this looks an awful lot like petty retaliation against journalists for having the temerity to report on things like the EPA’s response to an environmental catastrophe—or any number of other things, like Pruitt’s extremely sketchy ties to the climate change denial movement, war on environmental science or plans to eliminate huge numbers of EPA staff. Going after reporters might please the big, stupid and extremely petty man in the Oval Office. But that’s precisely because responding to bad publicity by doubling down and smearing critics is the way a child would handle things. Never mind the toxic waste potentially spread all around Houston—a bunch of Trump appointees’ egos are the real victims here. Other EPA press releases continued to load normally. Obviously, removing the statement from the website—if indeed that is what happened, rather than a technical error—would do nothing to mask the fact the EPA wrote it in the first place. An archived version of the statement is available here. Update, September 4th, 2:40pm: The statement is again visible on the EPA website.